Thanks to everyone who joined us for Shakespeare in the Grove 2015! Photos also feature Andrew Lemieux, Riley Lassin, Allison McDermott, Gabriel Aprea, Samantha Dena, Conor Hamil, and Lizzy Jutila. Press Release for ARTFARM’s Shakespeare in the Grove Production of A Midsummer Night’s Dream, July 15 – 19 and 22 – 26. 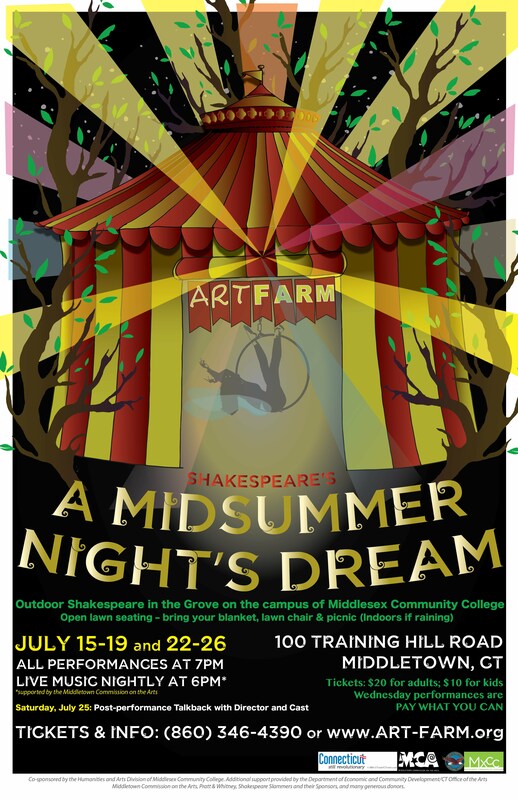 In celebration of ten years of Shakespeare in the Grove, the Middletown-based theater company ARTFARM will be presenting a production of A Midsummer Night’s Dream. Performances of this popular comedy will be held July 15-19 and 22-26 in the Grove at Middlesex Community College in Middletown, with live music preceding each performance. Bring lawn chairs, blankets and a picnic and enjoy professional music and theater in the beautiful Cedar Grove overlooking the Connecticut River Valley. Director Dic Wheeler, who is also a seasoned circus director and performer, will be incorporating the magic and artistry of circus in the Shakespearean comedy. The production will feature clowns, aerialist fairies, jugglers and stilters, in addition to the core of seasoned Shakespearean actors, promising a performance that is entertaining and fun for all ages. This year’s production will also kick off ARTFARM’s Shakespeare400 Passport program, in honor of the upcoming 400th anniversary of Shakespeare’s death. Audience members attending the performances will receive a special “Passport” which highlights Shakespeare-related events throughout Connecticut from July 2015 through May 2016. Those who attend 10 or more passport events will be entered into a drawing for big prizes in May 2016. Tickets are $20 for adults and $10 for kids. July 15 & 22 are “Pay-What-You-Can” performances. The performance on Saturday, July 25 will be followed by a “Talkback” with the director and cast, moderated by Middlesex Community College President Anna Wasescha. Middlesex Community College is located at 100 Training Hill Road, Middletown, CT.
Shakespeare in the Grove 2015 is made possible by generous grants from the Department of Economic and Community Development/Office of the Arts, the Middletown Commission on the Arts, and Pratt & Whitney. Shakespeare in the Grove is co-sponsored by the Humanities and Arts Division of Middlesex Community College. For tickets and information, contact ARTFARM at (860) 346-4390, email info@art-farm.org, or go to www.art-farm.org. Poster design by Jason Leinwand.